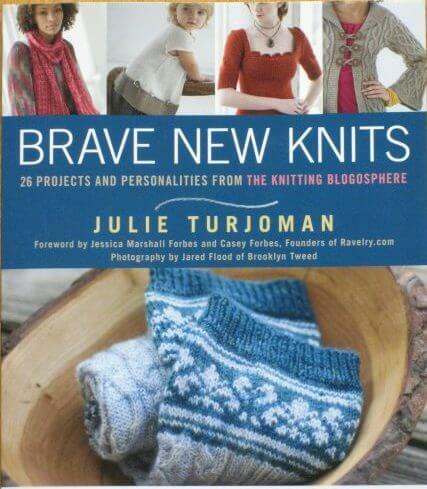 Upcoming Brave New Knits Event at Katonah Yarn Co.
On Tuesday, May 3rd from 6 – 8 pm, I will be visiting Katonah Yarn Co. during their weekly knit night, to sign copies of Brave New Knits and to share all the wonderful projects from the book with a complete trunk show. If you’re in the area and have been having a hard time deciding which project to make first, this is your chance to see the projects in person and choose your favorites. 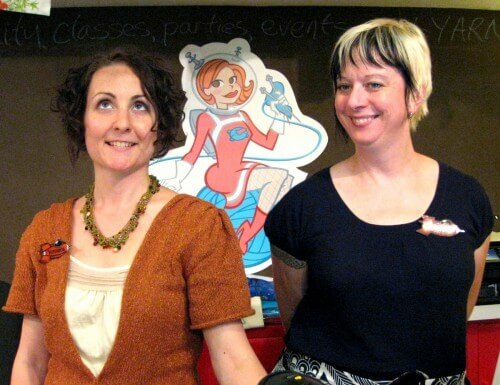 Shop owners Jennifer and Rae will help you select the perfect yarn. Katonah is not far from where I grew up, and I am so excited to be able to spend an evening with a great group of knitters from my old stomping ground! Katonah Yarn Co. is located at 120 Bedford Road, Katonah, NY. See you there! 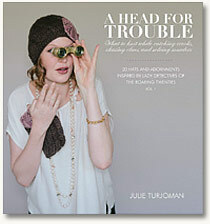 The Spring 2011 issue of Knitcircus is up, and it’s a terrific issue full of gorgeous patterns! 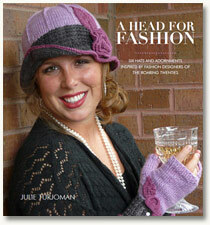 In addition to a collection of fabulous patterns and articles, it includes a lovely review of Brave New Knits. 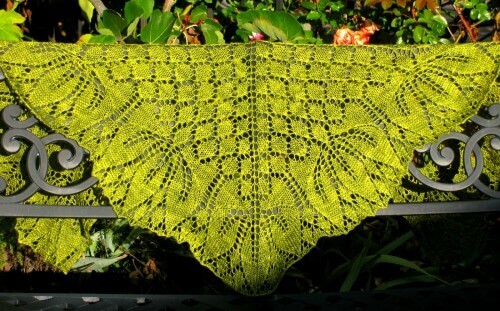 There’s also an interview with Alana Dakos, of Never Not Knitting fame. There is also a delectable-sounding recipe for French macarons, those sublimely light and crispy cookies with the soft center that just melts in your mouth. As the recipe is gluten free, I will try it this weekend – and let you know how they turn out! Knitcircus editor-in-chief Jaala Spiro (the soul of generosity!) has invited me to host a giveaway featuring one one-year subscription and up to three pattern collections from this issue. Does one of these enticements have your name on it? Leave a comment on this blog post by midnight Pacific time on Wednesday, February 9 to be entered in the drawing. I’m working on a new sweater project… despite a nasty bout of flu, my knitting mojo has finally returned. Will share WIP photos soon, so stay tuned! 1) Brave New Knits has gone into a third printing, only five months since its original publication at the end of August, 2010. I had the fantastic honor of doing author signings at both TNNA in Long Beach, CA and at VK Live in NYC; it was so amazing to hear how many knitters keep BNK on their bedside tables to read those designer interviews as much as to drool over the patterns. 2) Including the holidays, I’ve been stuck and/or stranded in at least two blizzards. Can’t remember the last time I had so much fun in inclement weather. These experiences made me realize that I should just shut up about my less-than-favorite aspects of living in California, because absolutely no one back east feels the least bit sorry for me; in fact, they undoubtedly view me as the thin-blooded sissy Californian I have become. 4) I learned that I have a gluten sensitivity (but not celiac disease, for which I am grateful), and have embarked on a strictly gluten-free diet. One of my two New Year’s resolutions is to explore the GF lifestyle and make sure that everything I eat is as delicious as anything wheat-based would be. It’s a whole new world out there. So far, I’ve discovered some great GF blogs and websites, and made my first batch of GF biscotti – they are so delicious that I had to stick a packed baggie of them in the freezer to keep myself from snacking on them all day. 5) In 2011, I will not buy a single item for my own use that was made in China. Here’s a challenge: go take a look in your closet. If it looks anything like mine, somewhere between 50 and 95 % of what you own and wear was made in China. It occurred to me that as a consumer, I have supported the Chinese economy very generously for many years. I decided that it’s about time I searched for ways to support my own country’s economic efforts more conscientiously. If you, like me, shop the sales at stores like J. Crew and Banana Republic (and sister stores Gap and Old Navy), not to mention Target and large department stores – pretty much all mainstream clothing purveyors – then most of what you buy was made in China. 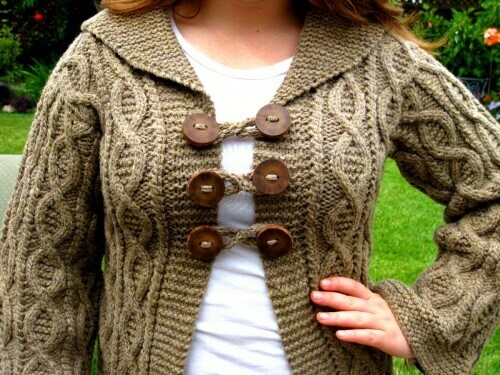 All those great sweaters from Anthropologie that we scoop up in order to figure out how to knit them for ourselves? Made in China. Next to nothing in those stores is made in the U.S. Sure, you’ll find a few things manufactured in India, Vietnam, and Mexico, but for the most part they come from China. No wonder that country pretty much owns us. I won’t even start on home electronics, small appliances, and toys. I learned yesterday (thank you, Shannon, for passing along the link) that Brave New Knits made it into the Top Ten Craft books category in Amazon.com’s Best Books of 2010. If you could see me now, you’d be laughing, because I’m doing a very, very, very happy dance! At Portland, Oregon’s Knit Purl, the walls of color were a total feast for the eyes, though I didn’t manage to catch those stealthy staffers trying on the garments from Brave New Knits. 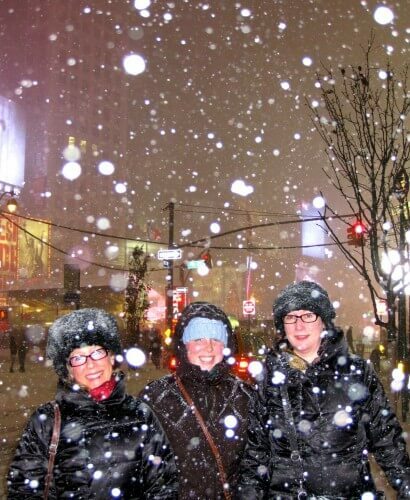 The weather in NYC was absolutely bizarre last Thursday, when I was due to appear at Knitty City on the Upper West Side for a Brave New Knits signing. Outside, it was cool but humid, threatening rain all day but not making good on the threat. From the surrounding suburbs came reports of tornado-strength winds and downpours. My fears that this strange weather would keep knitters away from the event proved unfounded – Pearl’s charming, packed-to-the-rafters shop was equally packed with knitters who lobbed questions at me and at the super-special guest designers who also came to the event; Kirsten Kapur of Through The Loops, Melissa Wehrle of Neoknits, and Connie Chang Chinchio of Physicsknits! It was wonderful to see all of them again and catch up on the last year of their lives. All continue to knock out fabulous designs, not surprisingly. 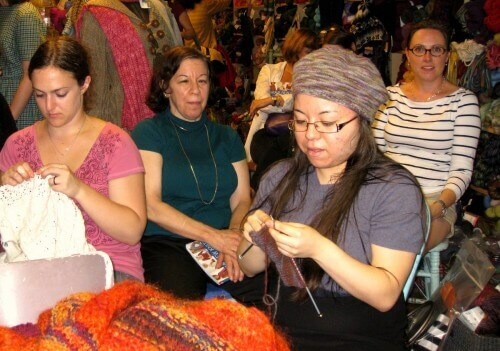 Knitters who frequent Pearl’s Upper West Side shop are a dedicated group; all were knitting away on their individual projects throughout the event, and it was fun to see what everybody was working on. 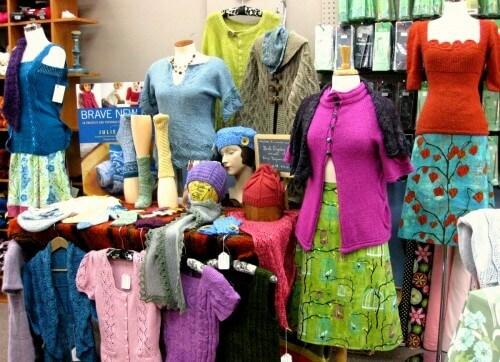 Knitty City has a friendly, homey vibe that makes it a great place to visit. When I arrived (dragging my steamer trunk-sized suitcase full of Brave New Knits projects behind me) there was a group of knitters sitting at a round table working on their projects, looking as if they had been there all day and had no intention of going home. It’s the kind of shop you discover and then never want to leave. The fact that it is well-stocked with many of my favorite yarns made it all the more inviting. One of the many things I need to do better is post-event posting! A visit to the east coast at the end of September brought me to some fabulous local yarn shops, the first of which was Fibre Space, in Alexandria, Virginia. What a great space! And although I was sorry not to be able to meet Danielle Romanetti, the owner of Fibre Space, I was very well cared for by Veronica and staff. 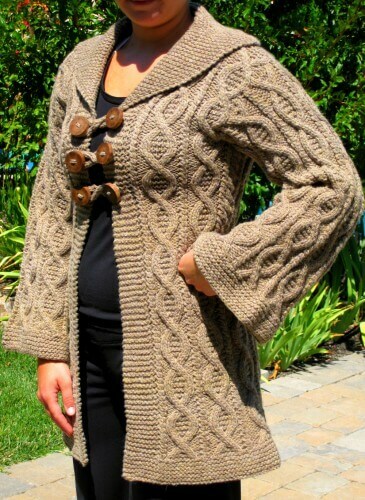 Here’s Veronica modeling Jen Hagan’s Global Cable Coat from the book- she really rocked it! I absolutely loved Fibre Space’s Jetson-like vibe, with funky light fixtures and funny-faced mannequins to display the projects from Brave New Knits. Oh, and did I mention all the yummy yarn? Located in charming Old Town Alexandria right outside of Washington, DC, Fibre space is a gorgeous and friendly shop all round. Since my signing was scheduled for one of the shop’s regular Thursday night Knit Nights, we had a great crowd. I was busy the entire evening signing copies of the book! Not only did the shop run out, but they took orders for another dozen copies. Thank you, Fibre Space! The icing on the cake was that I got to stay with a dear friend who lives in Washington; we go back a long way, but don’t get to see one another very often. How lovely to have a local stop next up on my Brave New Knits tour! 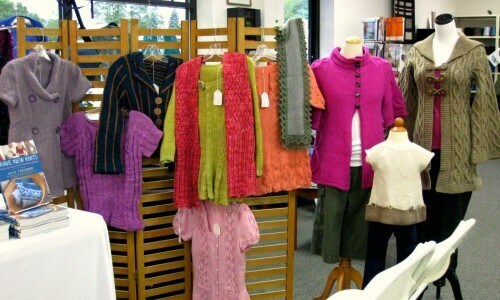 Bobbin’s Nest Studio is a fabric and yarn store located just an hour south of me, in Santa Clara. And owner Erin McGee’s shop is wonderfully diversified, selling both gorgeous yarn AND amazing fabrics and patterns for sewing everything from clothing to home accessories. What a great mix! Colorful, touchable, and a feast of eye candy in every corner. Take a look at the skirts in the photo above; they are shop samples that just happened to coordinate perfectly with Mari Muinonen’s Krookus Cardigan and with Teresa Gregorio’s Milk Maiden Pullover from the book! Erin is a tall drink of water, and I guess the beverage that most closely describes me is a single shot of espresso; you can’t tell from the photo above, but she is bending at the knees, and I am standing on my tip-toes to bring us to a similar height. Jordana Paige, above, whose lovely and delicate Delysia Camisole is one of the Brave New Knits projects, is introducing a new collection of knitting bags to her product line. It was great to have her at Bobbin’s Nest for the afternoon, too. Customers were very excited to have a two-for-one! And speaking of customers, I met both a Facebook Friend (Hi, Diane!) AND a Ravelry acquaintance (That’s you, Ien!) for the first time in person because both came to the signing. The internet is responsible for all sorts of meet ups these days. With its carefully edited selection of yarn, books, fabrics, and patterns, all of which are artfully displayed in vintage cabinets, with cozy sofas and overstuffed chairs tucked into corners for customers who just have to sit and knit a while, Bobbin’s Nest Studio would definitely be my go-to shop if it were located closer to home. 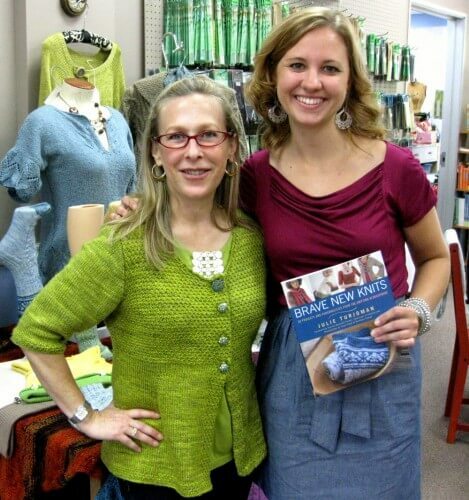 The Brave New Knits book signing and trunk show tour has begun! Kicking it off with a trip to New England, I visited WEBS for the first time – surely a dream destination on every knitter’s wish list. Retail Store Manager Karen Minott made lots of display forms and hangers available to me, which made it easy to set up all of the book’s fabulous projects for visitors to admire. About 20 customers came to hear me talk about internet resources for knitters. I took a brief poll at the beginning, and about half of the knitters in the audience raised their hands when I asked who did NOT regularly use the internet! And those same customers, one by one, pulled out notebooks and started taking notes as I talked about the list of resources on my outline – which made me feel great because I love to spread the word about Ravelry, Yarndex, Patternfish, and other great sites that serve our community. Here’s Karen with me at the end of the evening. 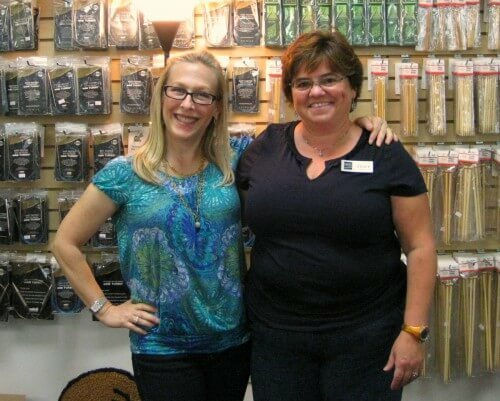 That display of knitting needles behind us is just the tip of the iceberg at WEBS. Karen was kind enough to give me a tour of their building before my talk began, and I was absolutely gobsmacked to see so much yarn under one roof. There were several dazed-looking customers pushing actual shopping carts back in the warehouse, loading up with bags of gorgeous yarn! The next morning I drove from Northampton to Boston, where I had the rest of the day to myself to explore and enjoy one of my favorite cities. With the weather cooperating, I just had to get outdoors after a couple of hours in the car. 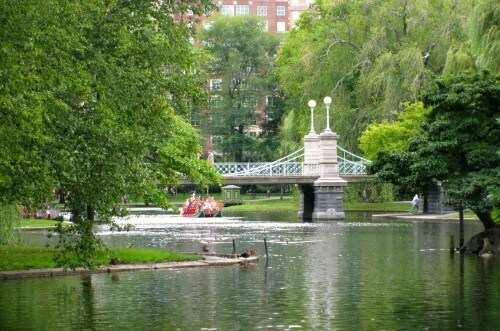 A stroll through the Boston Commons put me back into a good mood (I tend to think I love a good road trip until I actually get behind the wheel and drive for hours by myself with only the car radio for company!). Walking back to my hotel via all the boutiques on Newbury Street was pretty tempting. If I hadn’t blown my budget at WEBS the night before, it could have been downright dangerous. 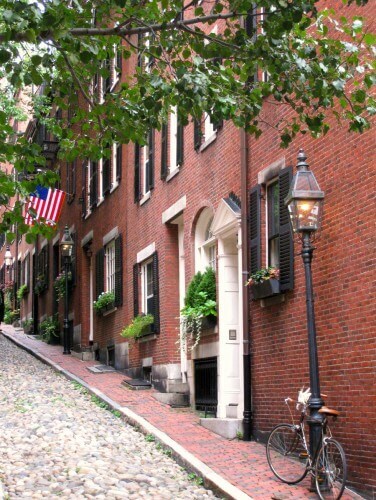 Continuing my explorations in Beacon Hill, I discovered charming cobblestone streets like this one, lined with beautiful old row houses, lushly planted window boxes, and antique street lamps. Saturday was the signing and trunk show at Windsor Button in downtown Boston, where Susan Baker was my charming host for the event. The shop is packed full of yarny goodies and, yes, they do have the MOST amazing button collection. 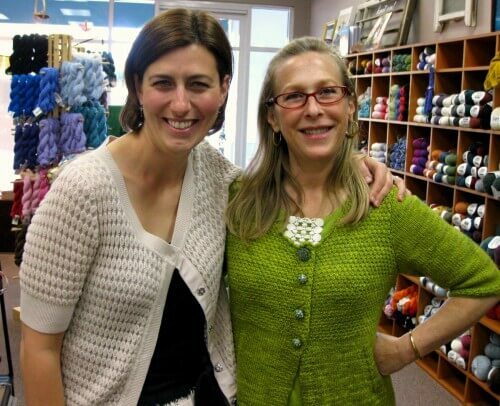 Special local celebrities whose projects are in Brave New Knits joined me at Windsor Button, including Grumperina. It was great to see Ann Weaver (center) of Weaverknits again – her first self-published pattern collection is due out any day! And Angela Hahn (right) of Kntitude fame drove in from Cape Cod to the event; it was such a pleasure to meet her in person at last, since when we did her interview she was still living in Italy. The event at Windsor Button was so much fun, and sold out of all the books Susan had pre-ordered! 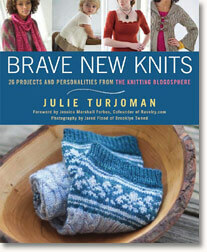 Two terrific reviews appeared within the last few days about Brave New Knits. One is by Carol Sulkoski of Go Knit In Your Hat fame, which you can read here if you are so inclined. 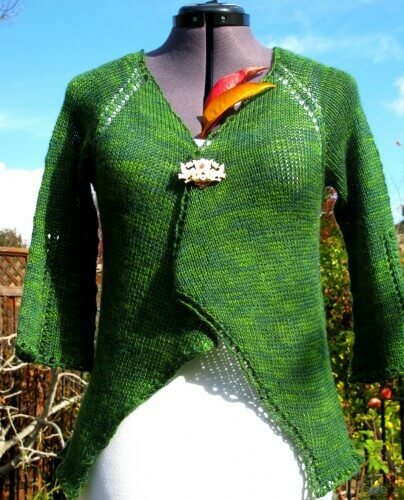 The second review is by Leslie Petrovski of Nake-id Knits, whose witty and insightful articles for illustrious knitting industry magazines such as Vogue Knitting and Yarn Market News are always the first I turn to when I receive a new issue. You can read her review here. I was thrilled by both of them; you never know how an impartial reviewer is going to react to your precious baby lovingly crafted book, after all. I have tremendous respect for both of these women as writers (and knitters), and confess that it made me nervous to think of them reading Brave New Knits with a critical eye. Is it possible that these two glowing reviews have anything to do with the fact that according to Amazon’s ranking of bestselling books in various categories, Brave New Knits is, for the moment at least, the #2 bestseller in the Knitting and Needlecrafts categories? 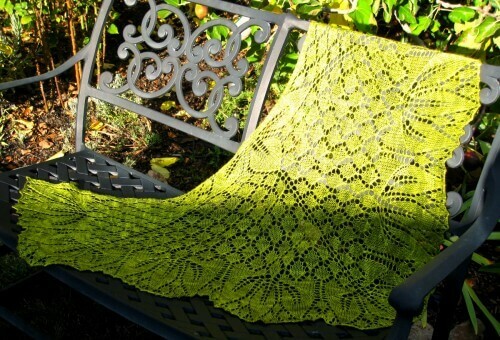 Almost all of the book’s projects have been uploaded to Ravelry at this point. Errata and forum discussions are underway in the new Ravelry group called Brave New Knit(ter)s.
While we chatted over coffee last year, in a busy Starbucks near her office in New York City, Melissa gave me a peek at her bursting-with-ideas design notebook. As we discussed her knitwear designs and inspirations, she pointed out a few sketches of stunning garments that could be suitable for Brave New Knits. 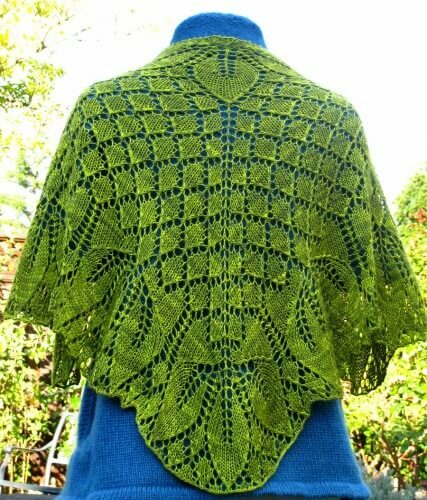 When she came to the Origami Shrug, I hesitated for a fraction of a second – I hadn’t seen anything like it in all my years as a knitter, and I was definitely intrigued. By the time she had finished describing its unique style and construction (Reversible lace! A single seam!) I was sure this would be the one. And what a stunning success it is. 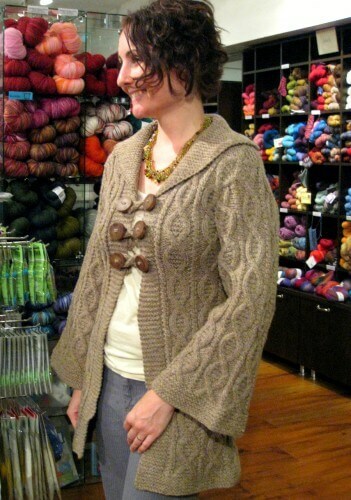 When Jen Hagan of figknits offered to make the Global Cable Coat for Brave New Knits, I had to pinch myself. The sketch she sent me was promising, but it was impossible to imagine how much more gorgeous this sweater-coat would be in real life. Knit with bulky weight, hard-wearing Beaverslide Dry Goods McTaggart Tweeds & Heathers, this is hand-knit outerwear at its finest; wam and elegant, stylish yet practical. Although it would probably be too warm for all but our chilliest California winter days, I am sure that the Global Cable Coat will be a big hit in parts of the country that have a real winter (though I have to make it anyway… because Resistance. Is. Futile.). Its simple cable repeat set off with garter stitch borders gives a luxurious texture to the project, yet in terms of difficulty an adventurous beginner could make it. Beautifully rustic, hand-crafted wood buttons by Jay Beesmer of Wooden Treasures are ideally suited to the hearty texture of this wool. After taking a much-needed break this summer, Jen is back at work with renewed focus as we move into fall. She is blogging again and trying to do it more regularly. 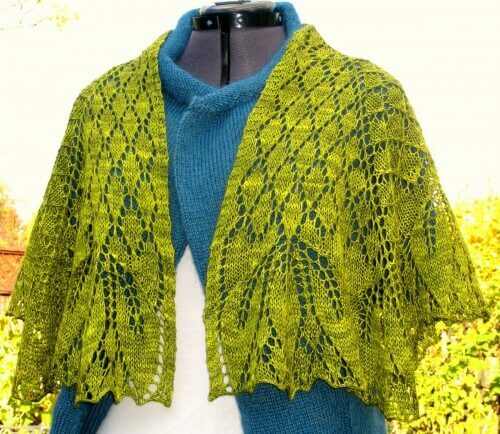 She has also put business pages on Facebook for both the Figheadh and Mirth pattern collections, and is trying to be more present and attentive on Ravelry. On the freelance front, she is still working with Ravenwood Cashmere (a U.S. cashmere goat farm… when can we get some of THAT, I’d like to know?!) as she continues to promote local fiber. She was thrilled to see Pam Allen’s new business Quince & Co., because sourcing fiber domestically sets a great precedent for what Ravenwood Cashmere is trying to build on. As knitters and crocheters learn about the domestic fiber options becoming available for their knitting and crochet projects, she hopes more will make the effort to track it down and use it in their projects. 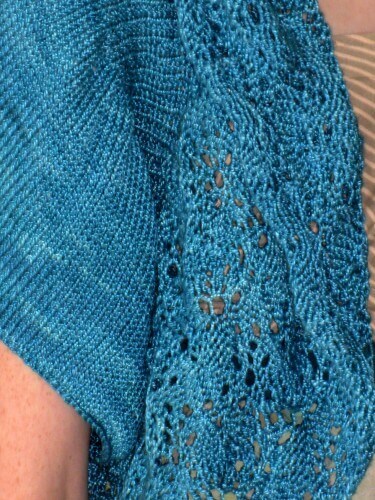 In addition to Brave New Knits, she has a chapter on blocking in DRG’s new The Perfect Finish coming out in September. It will be offered as both a hard copy and as an e-book. Other books with her designs in them are in the works and are thus the dreaded “secret knitting projects” that cannot be talked about yet. No doubt, all will be well worth the wait! 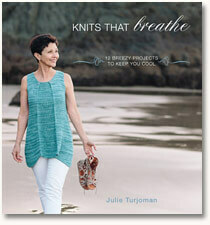 Knitting books that feature a wide variety of projects (as opposed to knitting books that focus on one kind of project such as shawls, or hats, or sweaters, etc.) always win points from me for including at least a couple of pairs of socks. As I assembled the projects for Brave New Knits, I knew there would be socks and I certainly hoped that the designers who volunteered to make those socks would offer up unique ideas. They did not disappoint, and today the spotlight is on Kirsten Kapur of Throughtheloops, whose lovely Sockstravaganza project made the cover of the book! 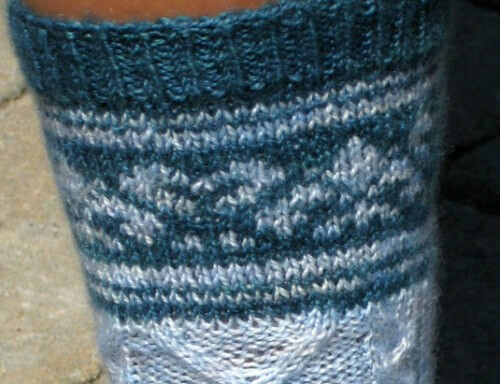 The Sockstravaganza socks are so named because they incorporate both cables and colorwork into a single really fun design. 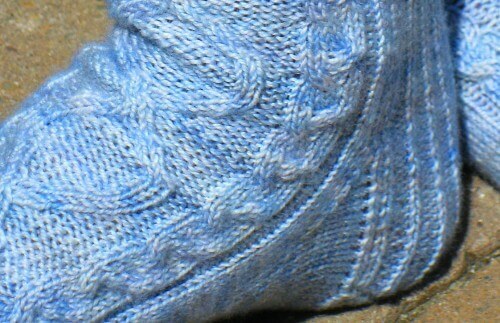 The colorwork cuff and leg continue down into a single color cabled foot with ribbed heel. Not only is the fiber itself fantastic to work with for socks, shawls, and even tiny toys if that’s your thing, but Deb is a color genius whose yarns are beautifully semisolid, somehow managing to be both subtle and saturated. With the variety of lace weight, sock weight, and other yarns she carries in her Etsy store, it can be hard to choose which to buy, but her colors are consistently gorgeous! In the year since Kirsten and I met to do her interview for Brave New Knits, she has contributed to several more books, one of which is Stitchy McYarnpants & Caro Sheridan’s book Knitting it Old School, which was also released this month. Kirsten’s adorable Swing Time short-sleeved pullover has a delicious “pin-up girl” vibe to it, don’t you think? 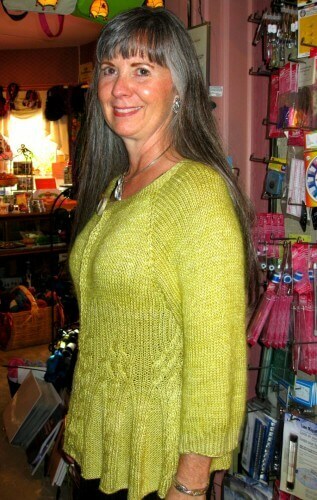 This October she will host the Through the Loops Mystery Sock KAL for the third consecutive year. Flickr and Ravelry, as well as her colorful blog (in which her musical and brilliant teenagers make frequent appearances as in-house models for all those knitted designs) continue to be the primary ways that she documents her work. Like many of us, Kirsten also enjoys connecting with other knitters on Twitter. Definitely an indie designer for the 21st century! Inquiring minds want to know where they can find more information and read reviews about Brave New Knits before plunking down their hard-earned dollars to buy it. So here is a list, which will be updated regularly, of the places where you can read about the book, view select images of the projects, and find out more about the interviews with some of our favorite knitwear designers in the blogosphere.